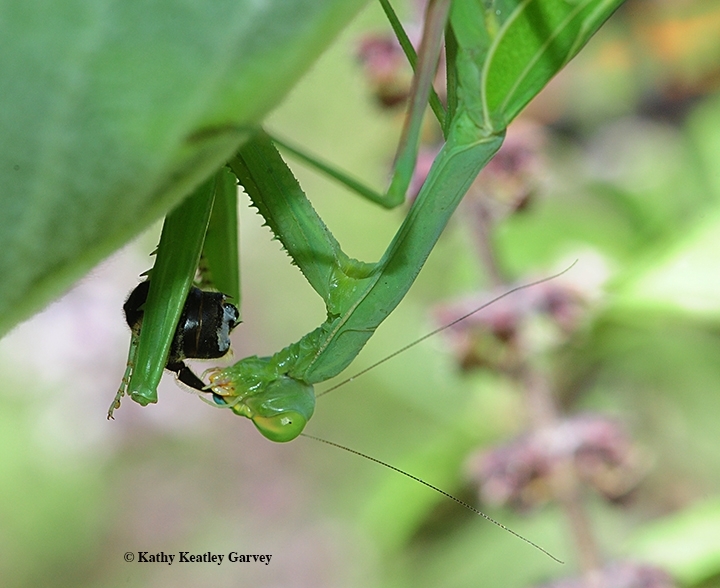 Everybody eats in the pollinator garden. Everybody. The pollinators in our garden in Vacaville, Calif., sip the nectar. They include honey bees, bumble bees, carpenter bees, sweat bees, European wool carder bees, hover flies and assorted butterflies. It works like this: the pollinators eat the nectar; the predators eat the pollinators. Nature's way. 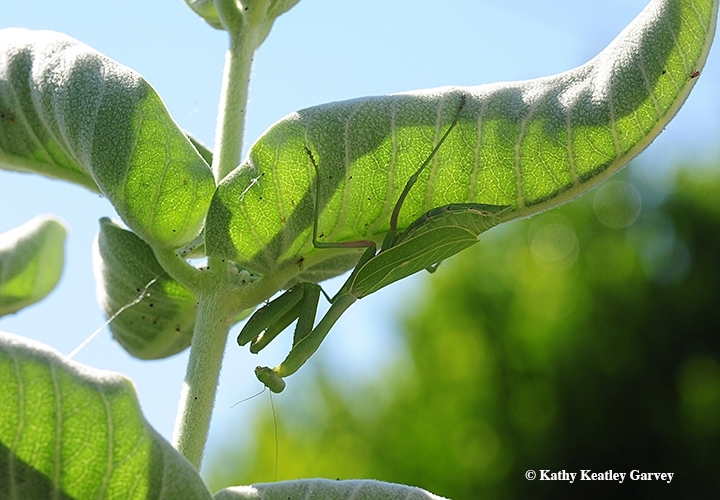 Today we watched a well-fed praying mantis, Stagmomantis limbata (as identified by Andrew Pfeifer)--look, ma, there's a "mom" in Stagmomantis--lurking beneath the leaf of a showy milkweed, Asclepias speciosa. She was apparently waiting to snag a monarch butterfly, but agreeable to a menu change. So camouflaged was Ms. Mantis that she appeared to be an extension of the leaf. There she clung, motionless but oh-so-alert. A monarch fluttered by, landing out of reach. Not so for the longhorn bees nectaring on the nearby African blue basil. A longhorn bee, probably a Melissodes agilis, just wasn't quick enough to escape the Usain Bolt-like swiftness and the grasp of the spiked forelegs. 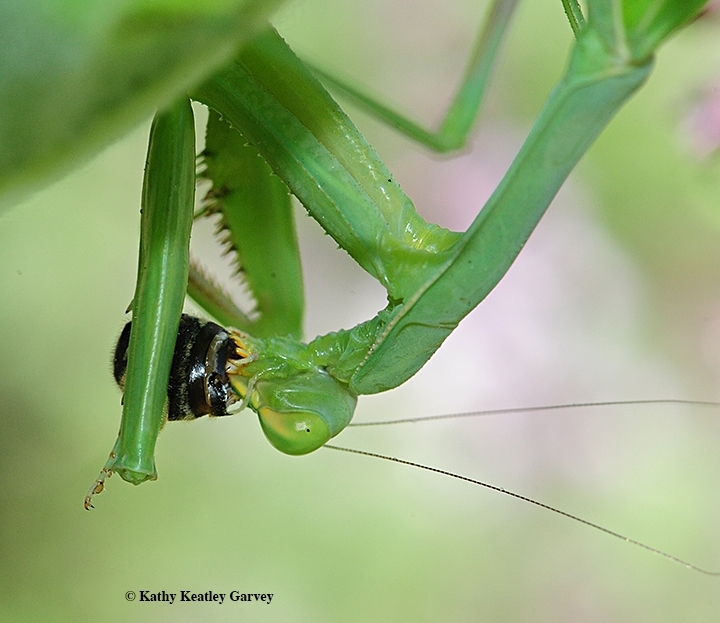 Ms. Mantis polished off the bee. 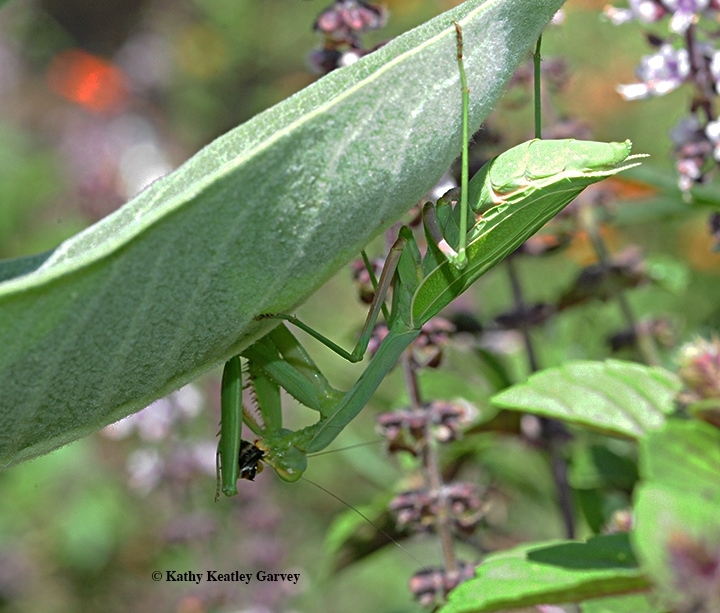 After her meal, Ms. Mantis climbed higher on the milkweed, slipping beneath another leaf to look for signs of "meal movement" below. Well, at least she didn't nail that monarch. Not today. Excellent catch for you and the mantis!